Strapped for cash this holiday season? 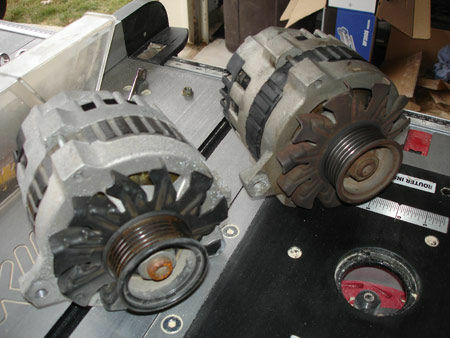 Replacing an alternator can cost you several hundred bucks at the local repair shop, but it's one of the simplest repairs you can do at home. With a few tools and about an hour you can swap it out yourself -- and keep your dough in your pocket where it belongs. Note: As this is a Craftsman-sponsored project, you'll notice a number of Craftsman tools in the photos, including Cross Force Wrenches. But here's a secret: we already owned 'em all. They're the same tools we'd have used if they weren't sponsors. Really! First and most importantly: disconnect the battery. There may be several wires or just one wire on your alternator, but rest assured that one of them is hot. 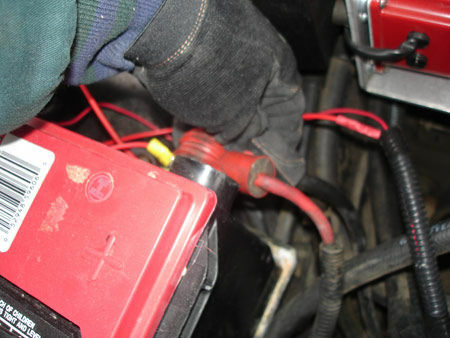 If you don't disconnect the battery, you're very likely to end up grounding a live wire during the process. This causes cause all manner of bad things to occur -- not the least of which is giving you quite a shock. Now that the battery is out of the way disconnect the wire or wires from the back of the alternator. This is usually a very simple process but if you're unsure as to where they go, label them as you take them loose. 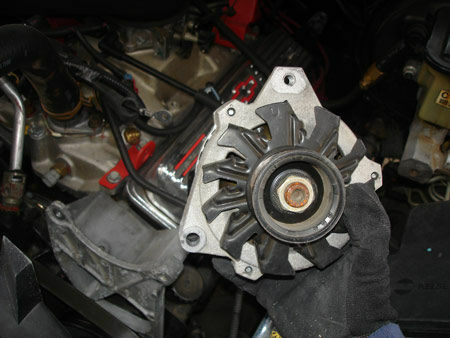 Every project has a tough spot, and this is the tough spot for alternator replacement: remove the belt from the pulley. Somewhere on your vehicle there is a tensioner pulley. You'll need to move it enough to slip the belt off the pulley. Our '95 GMC has a standard spring-loaded GM tensioner that required us to pull it back with a wrench. On some vehicles you'll find screw-type or rod-end type tensioners that apply tension by turning a bolt through threads to increase/decrease the length of a rod. 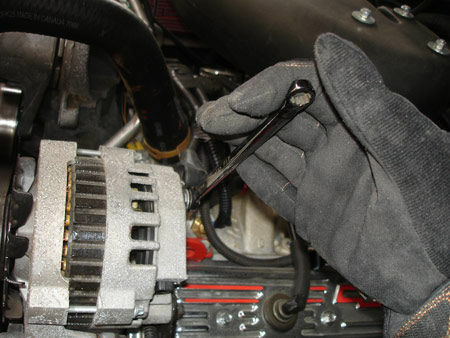 In this case, just turn the bolt/rod-end with a wrench or socket until it releases enough tension to allow you to remove the belt. In our case we grabbed a Craftsman 17mm Cross Force wrench and pushed hard. Normally that would be a pretty painful experience, but the Cross Force was designed for just such a situation. There's a 90-degree twist in the middle of the Cross Force wrenches, so you end up pushing on a flat surface. The result: we could push harder without discomfort. So we just laid into it and the belt came free. Once the belt is off just remove whatever bolts connect the alternator to the bracket and you're good to go. 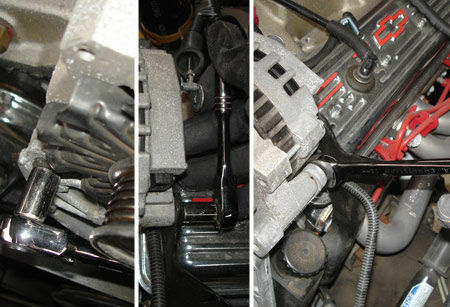 Our model required the removal of three bolts: one at the front and two at the rear. With the old alternator in your hand you're half way home. You'll likely find getting the new one back in goes much faster since you already know what size the bolt heads are and where everything is. Examine the replacement unit before reassembly and make sure it will work for your application. Our replacement was a junkyard find so it is great deal dirtier however it has the advantage of actually working -- a significant improvement over our previous busted unit. To complete the project just reverse the removal steps paying careful attention to belt routing and tensioning. Hell, even if you bought the set of Cross Force wrenches for the job you'd still be hundreds ahead of the cost of what a shop would charge -- and you get some new tools out of it. We can think of far worse outcomes. I always have to replace my alternator. Lifetime warranty :-). I can practically do it with my eyes closed. I have to replace my alternator in a Kia Cadenza 2014 any words of wisdom/advice? I have a 2013 Hyundai accent that we're trying to replace the alternator on. We removed the wires, belt, and bolts. But it still won't come out. Is there anything else that could possibly be holding ot down? What if my new alternator has the fan-like fins, and the old one does not? Its just a round wheel. Its for a 1986 Chevy Silverado. Thanks for the tips! I didn't even know that the alternator is connected to the battery. Do ALL of the wires have to be disconnected before you do any work on the alternator? Also I was wondering if you could explain how to know when it's necessary to replace an alternator. Are there certain signs to look for? Well done - thanks for sharing! thanks for sharing! I have a '88 GMC Sierra and they are ridiculously easy to work on. I just might try to do change my own alternator next time. Nanosec. 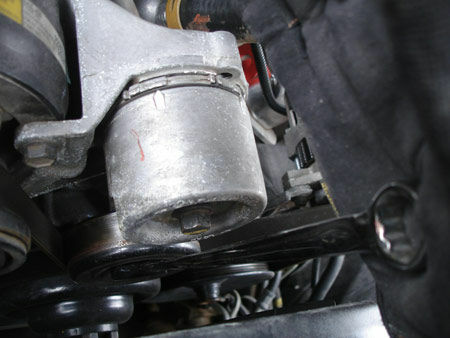 Belt removal is just as forward as taking the alternator off. All cars have a small diagram on how the belt should be. Great instructions! Hi guys I'm currently working on a car alternator as a generator, I'd like to prove and see it for my self how much torque it would require to properly pull the alternator to producing voltage greater than 12. Right now, I,ve seen it work @ about 2100rpm ( measurement taken on a 2" diameter mounted shaft. But still my design doesn't produce much torque, Can any body help/direct me to some ideas were i could find the possible answers to my question. Thanks to all, This is just a experiment for our data gathering purposes, pls. be kind, I'm just a plane beginner sourcing for info. Many thanks! im not sure bout torque. but maybe change out the voltage regulator and put a smaller pulley so itl spin faster if its belt driven. Id like to see you do an instructable for doing a alt. on a SATURN!!! muahahaha A SBC alt is WAY too easy! SL2? those are fast little cars. Just make sure it really is the alternator that's bad. Profanity will result if you find it was really something else like corroded cables or battery clamp, a slipping belt, or bad regulator (if the alternator has a separate one). There's inexpensive rebuild kits for some common alternators if you're really thrifty and want a little more challenge, although maybe no cheaper than a junkyard or swapmeet alternator. 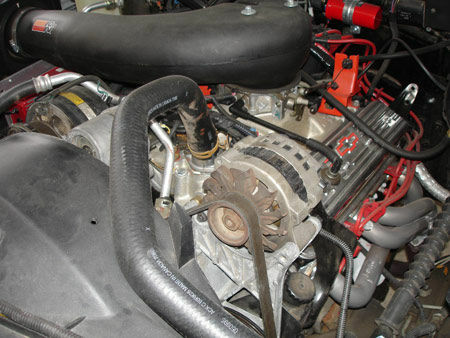 JC Whitney has rebuild kits, including some that convert the alternator for higher output. While you've got the alternator in pieces on the kitchen table, another pimptastic option is a shiny case or pulley and fan from the chrome aisle of the auto parts store. Or refinish the original case and fan to taste. Aluminum polishes up nicely, or can be wire-brushed or sanded to a satin finish and clearcoated.